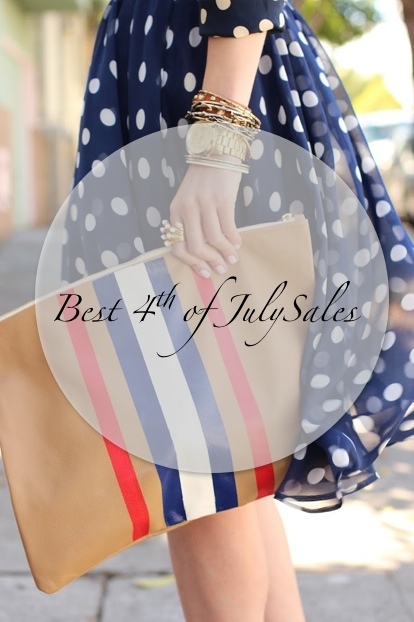 It's no secret, I can't resist a good sale and wanted to share a few of my favorite 4th of July sales! ASOS: You had me at, 70% off! How stunning is this striped beauty? Oh, and I've been stalking these too for some time now! Nordstrom: They have a ton of new mark downs for the holidays and offering free shipping. Loving the idea of stacking these dainty rings. Also these boho pants would make for the perfect swimsuit cover up! Piperlime: This is always my go to as it's one of the most well curated sites. I'm kind of obsessed to say the least! Their currently having their Lime Sale with up to 70% off all sale items. Currently coveting this summer dress and these sandals. Bloomingdales: Save up to 25%-65%. This parker dress is everything and perfect for wedding season! Also this L*SPACE bikini is great for a few upcoming vacations I have planned. Have an amazing 4th of July, if you're looking for a little patriotic inspo come over yonder. I'm off to Los Angeles for the weekend to visit a few of my best friends from college and would love for you join the fun over on instagram. Great tips! Which did you hit up?